The innerspring mattress is the oldest and most common type of mattress. Its basic design hasn't been changed or improved for decades. 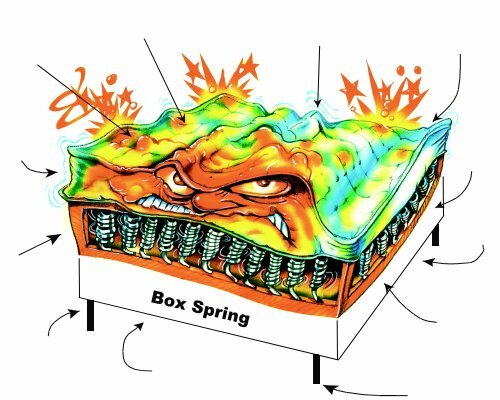 It still consists of 300 to 600 springs arranged inside of a mattress cover, and the strength and number of these springs determines the firmness of the mattress. In the past, more than 95% of the population slept on spring mattresses, but now, mattresses, such as the Pure Health Mattress® are taking over the market. In operation, the weight of a person lying on the spring mattress compresses the springs. But, due to the body's irregular shape and weight distribution, some springs are compressed much more than others, resulting in the creation of painful "pressure points". These pressure points affect your body all night long while you are in the "unconscious state" of sleeping, causing continual tossing and turning, back aches, stiffness and numbness ... depriving you of quality sleep. An innerspring mattress set can break down very quickly. As the springs are compressed over and over, they become weaker, and weaker. In a relatively short time, the springs that get compressed the most (in the center, where most of the sleeper's weight is) begin to weaken, causing sagging. At the same time, the fillers in the mattress cover top (usually low-density foam and other fillers) compress and form body impressions that make the mattress uncomfortable and unsightly. That's why mattress manufacturers recommend flipping and rotating a spring mattress regularly. The cover of a spring mattress can get inundated with dust mites and soiled in a short period of time. When a spring mattress needs to be replaced, you need to purchase a whole new set, which can be very expensive over time. Our Pure Health® Mattress is constructed of replacable components. So, rather than replacing the entire mattress, you can purchase only the parts you need. Also our mattress components are thoughtfully designed so replacement of any parts would be rare. For example, the thick memory foam layer is in three sections, that can be rotated to evenly distribute wear. The mattress cover is removable and can be laundered, eliminating dust mite infestation, and maintaining the "loft" of the wool filling. Even the high-density foam edges can be rotated. This makes our Pure Health® Mattress the most economical mattress, so it can actually cost less! Plus, you get to enjoy all the unique Pure Health® Mattress benefits. Our Pure Health® Bed has far more benefits and none of the Spring Bed problems. It can also save more money than it costs!